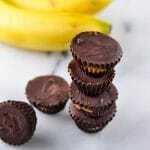 These chocolate peanut butter banana bites take 3 ingredients (seriously!) and are super delicious and simple to make! Gluten-free, dairy-free, vegan AND low in sugar, these little bites are the perfect dessert that you won’t feel guilty about eating! Did you know that yesterday was National Peanut Butter Day? I must have been feeling it, because I was all over the peanut butter experimentation. To be honest, National Peanut Butter Day is kind of every day for me. I love nut butter. From cashew butter to almond butter to walnut butter, I love them all. But, peanut butter will always have a special place in my heart. I grew up eating peanut butter and sugar sandwiches, no joke. I wasn’t a fan of jelly and my mom always put sugar on my sandwich for a little sweetness and crunch. I’m not talking about mounds of sugar for all of you scrunching your noses up at me right now. Just a little sprinkle. Though, nowadays peanut butter is eaten daily with some apple slices or even a banana for a snack. Yesterday, it became apparent to me that I had some bananas that needed to be used pronto. I had bought sixteen (16!!!!) bananas for the week because… well I actually have no idea why. It seemed like a good idea at the time since I like to put half of a banana in my smoothie in the morning, Michael eats them as snacks and I’ve been working on a peanut butter banana protein pancake for you all. But needless to say, we didn’t get through all the bananas and had a few extra. It’s the curse (I call it a major advantage) of being a food blogger. So back to the bananas! We had three perfectly ripe bananas sitting on the counter just waiting to be used. I threw one of them in the freezer for smoothie making, made delicious peanut butter chocolate dip with another one, and then made these frozen bites with my third banana. Let me tell you, these bananas could not have gone to better use because these bites were out of this world good! And only took 3 ingredients. How simple is that? When I made these bites, I wasn’t intending for them to be a blog post since really I just layered chocolate, peanut butter and bananas in a muffin tin. But as soon as I took my first bite, I knew this had to be shared! Peanut butter, bananas and chocolate in the simplest of forms but oh so good! Chocolate, peanut butter and banana form the dessert trifecta in these chocolate peanut butter banana bites! Really - just three ingredients pack a ton of flavor in this recipe. Gluten-free, dairy-free and vegan. 6 oz dark chocolate at least 70% cacao - also check to make sure it's gluten-free! Line a mini muffin tin with 12 paper cups. In a bowl, melt chocolate in the microwave in 30 second increments, stirring in between, until completely melted. Add a little chocolate to the bottom of each cup to just cover the bottom. Then, add a banana slice on top of the chocolate. Spoon a heaping 1/2 teaspoon of peanut butter on top of each banana slice.